It must be hard to guess my age simply by looking at my bookshelves. They certainly do NOT look like owned by a 34 years old. They are dominated by picture books and children’s books. Am I embarrassed? No way! Those books are beautiful and brilliant. I’m proud of them. Actually, I’m so proud that I’ve started sharing pictures of them on my twitter and Facebook with #whatsonmybookshelf. And this year I’ve decided to pick a book each month and write about it. Please mind, it won’t be a book review per se. As I said in the previous post, making picture books is for me a way to communicate my thoughts and feelings. So is sharing books I like. I will write about how wonderful each book is, but also I’d like to write about why the book has inspired and resonated in me that particular month and why I want to share it, hoping to inspire you too. It could be an old book from my childhood or it could be a newly published book. For January, the first Book of the Month post, I wanted to share something cheerful because the last year was pretty grim thanks to Brexit and the US presidential election. Unfortunately, the start of the new year hasn’t been any better. Things seem getting bad to worse so far. I usually don’t blog or illustrate something very political. However, what’s happening in the world right now, in US in particular, has made me impossible to stay quiet. So, the book I want to share with you from my bookshelves this month is The Boy in the Striped Pyjamas by John Boyne (Penguin Random House 2016). I think you can guess where I’m coming from. This week, I was massively disheartened by the Trump’s ‘Muslim ban’ executive order and I really don’t like where the world is heading (or at least it seems). And I feel this book, ironically and sadly, is timely and appropriate. This is a book we should read to remind ourselves not to allow the world to repeat the tragic history. Bruno doesn’t like his new house. 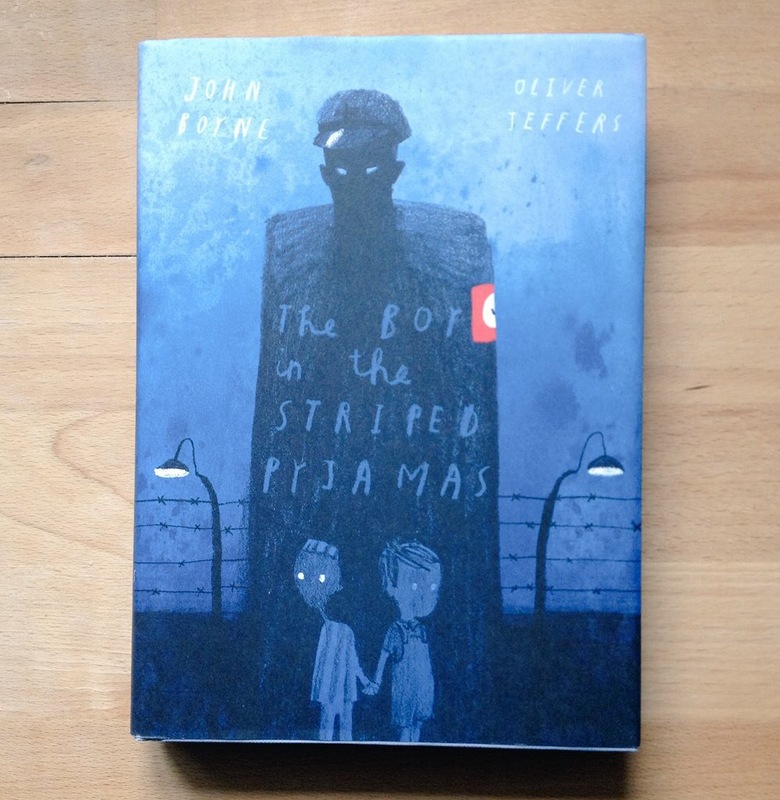 He had to leave all his friends behind in Berlin, and there are no children to play with here – until Bruno meets Shmuel, a boy who lives on the other side of the wire fence near Bruno’s house, and who wears a strange uniform of striped pyjamas. My copy is 10th anniversary edition beautifully illustrated by Oliver Jeffers. I love Oliver Jeffers’ picture books, but I think his simple illustration style is perfect for chapter books. Like Quetin Blake’s illustrations, his simple illustrations skilfully leave a plenty rooms for readers’ imaginations. In his book Illustrating Children’s Books: Creating Pictures for Publication, Martin Salisbury says “Good illustration, whether it is for adults or children, should provide a visual prompt, a pictorial counterpart to the text; its role is to add to the reader’s understanding, appreciation and enjoyment.” He points out, “(Edward) Ardizzone felt that the best view of the hero or heroine of a story was the back view. He rarely drew close-ups, feeling that ‘characters should be suggested in their settings rather than fully described’.” To prove the point, a 10 year old boy I met while I was mentoring in a writing workshop at Ministry of Stories told me that he preferred chapter books to picture books because they allow him to imagine what characters and places look like in his head. But, what makes Oliver Jeffers’ illustrations so special is the way he somehow conveys the atmosphere and mood of the story perfectly through those simple strokes of pencils and brushes without making it ‘in your face’. This is what I’m aspired to as an illustrator. I’d love to illustrate children’s chapter books but I’m not so keen on the style popular in the current market (too comic/manga-like to my taste). But I believe there is a market for more simple and poignant illustrations. So, here is my book of January. Hopefully next month’s pick will be equally great but more cheerful and so will the world! i’m glad i’m not the only one whose shelves is occupied by children and picture books! 😀 I’m in love with Oliver Jeffers illustrations too, I agree about his mood and atmosphere in illustrating. Simple vivid strokes but his strokes tells the story itself. its always on the spot! P.S. I have seen many blog posts recently refer to current events with what I can only describe as a pall — “a dark cloud or covering of smoke, dust, or similar matter.” We seem to have a broad stress level I’ve never seen before in my life. I feel it, too. You are not alone.